Last summer we went to the Shiva-Vishnu temple in Livermore, CA. My husband is a devotee of Balaji and he wanted to go to pay homage on the successful completion of some work. It was pure coincidence that as soon as we entered the shrine the Archana (prayer service) started. We felt so blessed. Like we do, I was praying for my sons, mother, for other things, and then in a clear distinct masculine voice within, I heard, "And what about your book?" I had written a book on Santana Dharma titled, "Eternal Way to Bliss". I thought, "My book?!" for me it was the least important thing in my life. But I guess it was my bit for upholding Dharma. Then I heard Him say something to the effect, "Write your next book on devotion. ON ME!" Ending with a thunderous voice, immediately followed by the priest shouting, "Govinda! Govinda! Govinda!" It was uncanny. Then the priest proclaimed, “Balaji is Govinda". My Govind? I didn't even know that because I never had an inclination towards Venkatesh Balaji. My devotion has always naturally flowed towards Giridhari, i.e., Krishn. After that powerful experience, I stepped out of the shrine, wondering if it was my imagination. Still pondering as we left the temple I thought, "On devotion? What a lame subject!" I was keen on writing the second book on the practical applications of spirituality. Writing it like an Upanishad, a question and answer exchange between student and Guru. What transpired over the days and months that followed brought great clarity on why I should write on devotion. Situations and events just happened, and things started falling in place. It is as per His calling that I embark on this journey. My expressions in this book an offering to Govinda, to that eternal consciousness (chetana) in all names and forms. I wanted to start this book on the auspicious day of Dussera, after the nine nights of Navratri, it is the tenth day of victory. It so happened that I planned a trip to India to be with my mother during this time. Then I decided to visit the hometown of Krishn, Mathura-Vrindavan for Dussera and start this book on devotion there. But then certain obstacles prevented me from being there during Dussera. Somehow things arranged themselves for me to be there on 29th October, 2012, which I later realized was Sharad Purnima. Sharad Purnima was the full moon night of the full blossoming of divine love; the night of Krishn’s divine dance, Raas, with the Gopis of Vrindavan. I could not believe I would be there on the spot where this happened on that very night! What a divine gift. What could be more auspicious and meaningful than to starting this book on the divine night of devotion. On December 23, 2012 it was Vaikunth Ekadasi, Gita Jayanti, in California, and again we went to Balaji temple in Livermore. Of course I was waiting for a message, what do you think! I was in the shrine of my beloved Balaji waiting...in deep reverence and love. I heard a voice in my inner ear, just one sentence, "Vaikunth is your heart.” My thought continued as, “And today the doors of your heart are open." Vaikunth is your heart? I pondered over this for several weeks. The Anahata chakra is the door to Vaikunth. So I guess it is through the heart that you reach Vaikunth. Heart is the inner self, not the physical heart. Later a Reiki master during told me that it's the only Chakra that radiates both outward towards the manifested ego and world, as well as inward towards the soul. Aho! That’s it! The pieces of the puzzle fit together now. 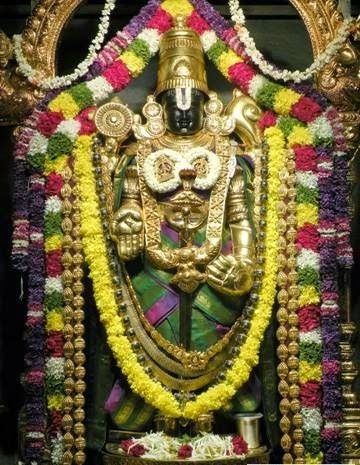 Vaikunth, the abode of Narayana emcompasses all the worlds of existence. Narayana epitomizes perfection in both the internal and external worlds. Narayana's Avatar Krishna exemplified this. Sri Krishna born on Ashthami the 8th day in the middle, signifies this perfect balance. That’s what I’ve come to attain in this life, not leave the mundane world and only be turned inward, but to move from individual consciousness to universal consciousness. I am going to learn from Krishna - the full blossoming of human potential. Now that the connection of my life with Narayana was clear, I still did not know what to write on devotion. For me it’s an experience that’s very hard to express on paper. Most of the time my devotion is expressed when I sing bhajans (songs for the divine), and feel that intoxication, the ecstasy. How could I express my devotion in words? I started with my trip to Mathura-Vrindavan and then halted again not knowing how to structure this book and with what content, what theme, what flow. I started listening to the Srimad Bhagavatam, the magnum opus on devotion. Swami-ji said that the stories and praise of the Lord in this text are meant to cultivate and foster devotion in our hearts. I thought I should write about the glories of my Krishna. However; that too didn’t seem to flow. It was then that I looked into my heart and saw what came. I should write about my story, my love for Krishna and His stories and His greatness would automatically be weaved in.